Identity vs. Use: What Is Religious Prejudice? Religious liberty is a key right recognized by all civilized people. The ability for one to not only worship as he believes but to live out that faith is enshrined in the United States Constitution as our first freedom, and it points back to the Pilgrims' efforts to settle a new land where they could do just that. Sanders: You wrote, "Muslims do not simply have a deficient theology. They do not know God because they have rejected Jesus Christ, His Son, and they stand condemned." Do you believe that that statement is Islamophobic? You can watch the entire exchange yourself, but notice what Bernie Sanders was objecting to was Christianity, although he did try to paint is as Voght holding a bias. Sanders is right in recognizing there are other belief systems out there, like Muslims, Buddhists, Hindus, and Jews. But any faithful Jew must believe the Hindu is violating God's first commandment to have no other gods before him. Muslims hold that Christians and Jews who reject the prophethood of Muhammad stand condemned before Allah. Atheists write books condemning Christians as being deluded and telling how their faith poisons everything. The objection that Sanders voices is an old one. How can Christianity be about love if you think everyone else is going to hell? But the problem is simply this: all beliefs carry truth claims. Therefore, if you don't hold to the the belief, you reject the truth claim that comes with it. If Muhammad was truly Allah's prophet, then Christians are wrong, but if Jesus is truly the resurrected Son of God, then Muslims are wrong. Both cannot be right. Even Bernie Sanders himself castigates others for not abiding by his economic beliefs. A Washington Examiner story recently highlighted Sander's tweet exclaiming: "How many yachts do billionaires need? How many cars do they need? Give us a break. You can't have it all." Is THAT what Sanders thinks this country is supposed to be about? 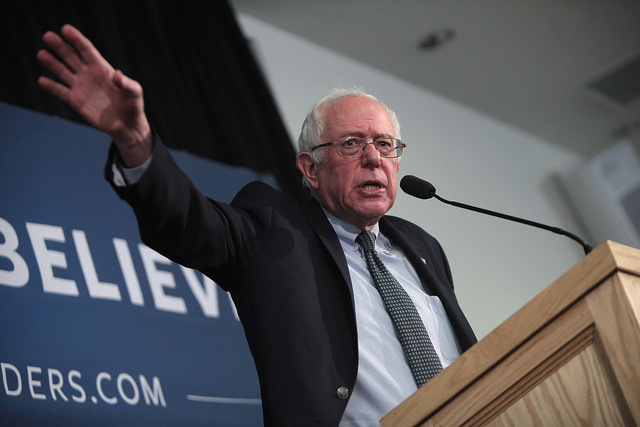 By positioning Vought's beliefs as disqualifying, Sanders is guilty of his own standard. He's condemning Vought's beliefs which he expressed in that Wheaton article. Sanders' belief in non-offensiveness is itself contradictory! But this is the problem with many progressives today. They cannot grasp the fact that a person can believe others have inestimable intrinsic worth while still believing they are in danger of offending almighty God. Heck, Sanders thinks it is OK for him (a millionaire with three houses) to tell others how much they should or shouldn't possess, but not for a Christian man wring for a Christian college's magazine to state basic Christian doctrine. Sanders is completely wrong. One should be able to be appointed to public office even if his orthodox religious views are not shared by a senator from Vermont. That is exactly what this country is about and what it always has been about. It's what makes America—dare I say—exceptional. 1. French, David. "Watch Bernie Sanders Attack a Christian Nominee and Impose an Unconstitutional Religious Test for Public Office." National Review. National Review, 07 June 2017. Web. 08 June 2017. http://www.nationalreview.com/corner/448393/watch-bernie-sanders-unconstitutionally-impose-religious-test-public-office. 2. Chaitin, Daniel. "Bernie Sanders Slams Billionaires, Gets Reminded He Owns 3 Houses." Washington Examiner. Washington Examiner, 20 Apr. 2017. Web. 12 June 2017. http://www.washingtonexaminer.com/bernie-sanders-slams-billionaires-gets-reminded-he-owns-3-houses/article/2620865. Image courtesy Gage Skidmore and licensed via the Creative Commons Attribution-ShareAlike 2.0 Generic (CC BY-SA 2.0) license.